Today Feel Good Friday is going to Costa Rica for a little Sentries Bien Viernes! La Tortuga Feliz (the happy turtle) is a volunteer-run organization in Costa Rica focused on turtle conservation. 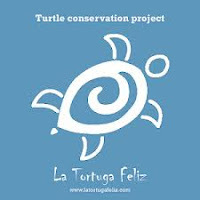 Poaching, fishing nets and pollution have taken their toll on the turtle population and La Tortuga Feliz (LTF) has been working to reverse that decline since 2006. Volunteers work with people in the local community to patrol the beaches looking for eggs before the poachers find them. As explained in more detail on their website, "These local inhabitants guard/patrol the beach (Caribbean coast of Costa Rica) together with volunteers, collect the turtle eggs and bring these eggs to a hatchery which is manned by volunteers on a 24 hours basis. Volunteers also participate in the care for and study of recuperating adult turtles in the turtle reduce and rehabilitation centre." This turtle conservation work provides income for the locals, which the people at LTF hope will take away the necessity for locals to poach the turtles and their eggs. Many of the people working for LTF are former poachers who are happy to earn money saving, rather than killing the turtles. Volunteers pay $35/day for room and board, which seems like a pretty sweet deal. While you're spending time learning about, and saving turtles, you can also take Spanish lessons and bond with volunteers from around the world! Not convinced yet? Check out the videos on their home page and view their photo gallery, which both give you a great idea of the work being done. If you can't book your plane tickets to Costa Rica just yet, you can follow the work of La Tortuga Feliz by liking their Facebook page and following them on Twitter @latortugafeliz1.